Habitat: Riparian, Upland, Mountain (lower elevation). 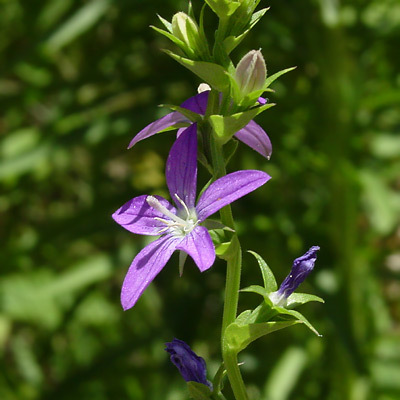 This wildflower grows in canyons and on rocky hillsides in the uplands and mountains and in moist riparian areas from the deserts to the mountains. A good place to find it is along the stream in Sabino Canyon near Tucson. Description: The flowers emerge from the leaf axils and are cupped by stem leaves. The individual flowers are sessile and have 5 ovate lobes. The flowers are followed by elongated, green drying to tan seed capsules that dehisce (open) at narrowly linear pores to eject the seeds. The leaves clasp the stems and are green, alternate, serrate, sessile, and rounded in shape. 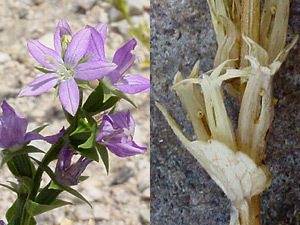 This plant has linear dry seed capsule pores, while the similar Clasping Venus' Looking-glass (Triodanis perfoliata) has broadly elliptical to rounded dry seed capsule pores.